Daniel Paul Merriweather (born February 17, 1982 in Melbourne, Australia) is an Australian R&B singer/songwriter. 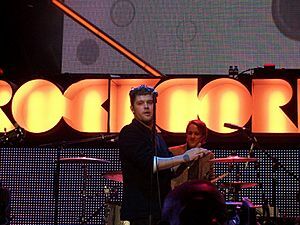 After several successful collaborations with artists such as Mark Ronson, he released his debut album, Love and War, in June 2009. It entered the UK Albums Chart at number two. Daniel Merriweather Facts for Kids. Kiddle Encyclopedia.